New Software - GSA PR Emulator — . :: GSA SEO & Marketing Forum ::. Since Google shut down his toolbarqueries.google.com API some weeks ago there have been a lot of trouble for all kinds of tools relying on this metric system. And there was even a good software called PRJacker. Some say it works for them, many say it does not. Recently they released an update to it and still people say it is no longer working for them. I can not judge on that but I felt the need to do something about it and added support for this in GSA Proxy Scraper. Though people complained about the price as they just needed that small feature in it and not the rest. Well I thought I would again need to do something about it and create a new tool just for this purpose. As it is v1.02, you might see some room for improvement. Leave them here in this thread and I will try to work on it. Anyway, please consider buying GSA Proxy Scraper instead when you see that those functions are something you would also need. Already bought PS, and the combination is wicked. Highly recommended... keep in mind, folks: You're gonna need proxies anyways to use this tool. Just bought ProxyScraper - how can we use it in conjunction with GSA SER (basically posting only TF>10 links for instance) - is it the same set up as PRJacker where you use the PR emulation? A small tutorial would be nice, as the setup is not included in the manuals. Is the PA/DA and CF/TF data really coming from moz and majestic or they are based on some other random calculations? @AsimNawaz the data is comming directly from them. Do I have to upload a list of URLs in to GSA PR Emulator or will it work as PR Jacker, meaning that I can upload a list of URLs in to GSA SER, and then GSA PR Emulator will check the metrics? A video is never wrong when you have developed such a great tool. it works out of the box...same as PRJacker or PR Emulation in Proxy Scaper. Cool, and you can confirm that all the metrics are reliable, so when checking them afterwards in like Majestic, it shows the same value as Emulator? That wasn't the case with PR Jacker, totally broken software. yes, I use there api so it should be the same. It should or have you double checked so its reliable? seriously, what else can I do wrong here when they replies with the data and I just take that? So yes, it is correct! Why don't you check that yourself...you have a demo version here. No need to be angry. I was just curious if it works, and not on assumptions that it works. Sorry. Lets say we only want TF20+ links, is it options, "Skip sites with a PR below 2", we have to check? After testing it in 30 min the conclusion is this: The software crashes after about 10 sec. I go with 10 semi private proxies and the normal settings of 20 threads and 5 sec timeout. Could you please look at this Sven? crashing? I have never seen that...can you send the bugreport? Does it work only for exact page we are posting, or can be rounded to take trust rank from main domain, and not specific page. Can you add option to cache result for domain, so it does not check data when we post again to the same site? I think 2 weeks cache minimum. could you please add the function to check the majestic domain flow metrics instead of the url flow metrics. 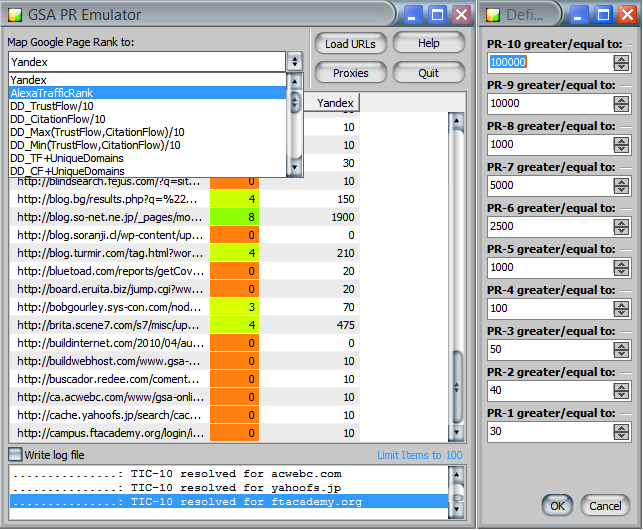 At the moment the emulator is checking the url metrics for http://domain.com/ when I chose "use PR of Domain" or http://www.domain.com/ (http://sub.domain.com/) for "use Pr of SubDomain". But I need the metrics for the root, for example: domain.com or sub.domain.com without http://. @rkecom is thatere really a difference if I send http:/domain.com instead of domain.com ? Hi Sven Can i purchase it through bitcoin? since thats the only payment method i can use for now. yes, it's a difference whether you send http://domain.com or domain.com. http://domain.com/ is the TF/CF of this specific url/page, based on external and internal links to this page and domain.com is the TF/CF of the whole domain, including all pages and subdomains, it's more an overall picture of the domain. And since we don't get links on http://domain.com/ in nearly all cases with GSA Ser, I prefer to take a look at the whole picture for most targets that GSA Ser hits. So an option to check domain.com and/or www(sub).domain.com without http:// would be great. OK it takes off the http:// from a root-url by default...so you get the whole picture now anyway. Whatever you set in SER is delivered properly. @Sven Can you make PR emulator work with SER on different port than 80? Right now it is impossible to use both PR emulator and Captcha breaker in simulate services mode as both sit on port 80. Windows hosts file does not allow to modify ports. second the request from azp. i ran into the same problem. but i'd also like this changed on proxy scraper since im using that. hmm yea I will add some change on that in the future. third the request from azp.. i am also using PS and CB at the same time.. also is this software the same with the one like url metric tools in PS?